Have you seen the latest edition (Summer 2018) of Best of Central Vermont Magazine? 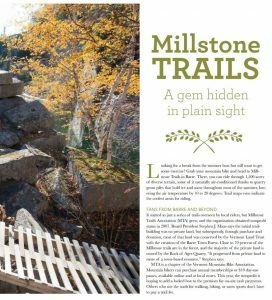 Pick up a copy and you’ll find a feature story on Millstone Trails, written by Phyl Newbeck and featuring beautiful photos by Jeb Wallace-Brodeur. You can also read the full article here (digital version provided courtesy of BCV). Thanks very much to BCV for covering us; happy reading!